A seasonal forecast system is presented, based on the global coupled climate model MPI-ESM as used for CMIP5 simulations. We describe the initialisation of the system and analyse its predictive skill for surface temperature. The presented system is initialised in the atmospheric, oceanic, and sea ice component of the model from reanalysis/observations with full field nudging in all three components. For the initialisation of the ensemble, bred vectors with a vertically varying norm are implemented in the ocean component to generate initial perturbations. In a set of ensemble hindcast simulations, starting each May and November between 1982 and 2010, we analyse the predictive skill. Bias-corrected ensemble forecasts for each start date reproduce the observed surface temperature anomalies at 2–4 months lead time, particularly in the tropics. Niño3.4 sea surface temperature anomalies show a small root-mean-square error and predictive skill up to 6 months. Away from the tropics, predictive skill is mostly limited to the ocean, and to regions which are strongly influenced by ENSO teleconnections. 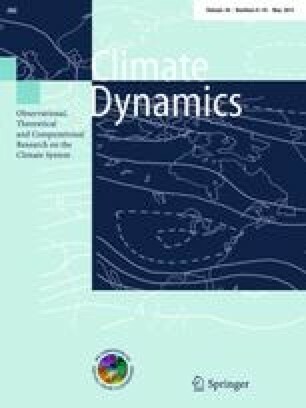 In summary, the presented seasonal prediction system based on a coupled climate model shows predictive skill for surface temperature at seasonal time scales comparable to other seasonal prediction systems using different underlying models and initialisation strategies. As the same model underlying our seasonal prediction system—with a different initialisation—is presently also used for decadal predictions, this is an important step towards seamless seasonal-to-decadal climate predictions. We wish to thank Tim Stockdale for many helpful discussions. We thank Helmuth Haak, Jürgen Kröger, Modali Kameswarrao, and Sebastian Rast for technical help with the model. All simulations were carried out at the German Climate Computing Center (DKRZ) in Hamburg, Germany. This research is supported through the Cluster of Excellence ’CliSAP’ (EXC177), University of Hamburg, funded through the German Science Foundation (DFG) (JB, DD, WM, RP), by the European Union’s Seventh Framework Programme (FP7/2007–2013) under grant agreement no. 308378 ENV.2012.6.1-1: Seasonal-to-decadal climate predictions towards climate services [http://www.specs-fp7.eu/] (JB, WM, DD), and by the German Federal Ministry for Education and Research (BMBF) project MiKlip (http://www.fona-miklip.de/en/index.php) (HP, WM).